When I was 16 or maybe 17, he taught me how to drive, in an Ambassador car. He was a tough teacher. The slightest of noise while changing the gear and 'thwack' there would be a sharp twang across my forearm. He expected nothing less than perfection. The first time he did it, I threw a tantrum and got out of the car and said "I don't want to learn to drive." He got out and made me get right back in and said "You will bloody well learn it and learn it well." Of course I learnt it and learnt it well. He would accept no less. I remember how he used to play with us on the beach. He would play Frisbee with us. He would also play 'running and catching' and he would run so fast that my brother and I would never be able to catch him. But how we loved trying! And then the swimming in the sea and the river. Oh the memories, it evokes! He was an excellent swimmer (too), my dad. He taught me (and my brother) how to swim and we learnt in the river with a strong current. Later the swimming pools seemed so tame, in comparison. Dad was very sportive and he was also a lot of fun. One time, as a child, when I was heavily into reading Enid Blytons, I badly wanted to find an 'old treasure map' like the Famous Fives. So I drew my own map and soaked it in tea, to make it look old and burnt the edges. (yeah, I was an innovative little devil :)) Then I buried it in sand in our garden and pretended to find it and showed it to my dad. He played right along and I was so delighted that he did not call my bluff. "That is indeed exciting. Let us go look for the treasure," he had said. He really has given me a treasure--a lifetime of truly treasured memories. And then, after I got married (too) the conversations and discussions we used to have. My dad loved books and I inherit that from him. I also could discuss anything under the sun with him. Almost every single day I used to speak to him on the phone. He was so much fun, my dad. He passed away this day four years ago. The way he died was as unexpected and dramatic as the way he lived. He went sitting down in his favourite arm chair, in the middle of a conversation. One minute he was watching TV and talking to my mother and the next minute, he had closed his eyes and he was gone. He was so fit, agile and had absolutely no illnesses. He was just 64. Those of you who have read my book, know all this ( and probably in detail too). But today I had to say it all again. I cried today for almost an hour.I missed him so badly. Most days I am fine, but some days,the aching just does not stop. Hi Preeti, Sorry to read about ur dad. This posting was so touchy. I lost my mom to a deadly tumor last year and every day I miss her. She was only 61. I close my eyes and relive the times I spend with her. The pain never seems to get better. Everyday I wish she was with me and my dad. Every day I question God on why he did this to me and my dad. I guess with time I will learn to live with the pain.Once again sorry about ur dad. I feel sorry for you but from what I read, I believe he is still alive in all your writings, success, good and bad times as you seem to have imbibed so much from him. We dont know your father but we see him through you and your writings. May his blessings be with you in all your good and bad times. A touching tribute to a life well lived. Your posts about your dad always touch a chord as I can relate so much to it. I find as the years go by only the beautiful memories remain. Your dad did the perfect job of being a dad Preeti, your childhood sounds beautiful. Your tribute to him is so apt. 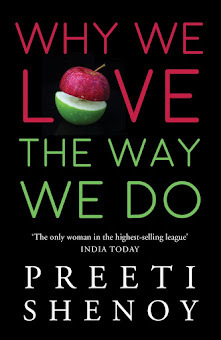 Hey Preeti... I understand ur sentiments... I'm also very close to my Dad. And like every fond daughter, I feel that my Dad is the greatest. So I can't think of a time when he is not around. Anyways, all u can do is be happy that u got a wonderful Dad. And, he will be definitely watching his little girl. And tell me, would he like to see u cry?? No, right? After hearing so much about your father from your blog and the book... I must say this is a well written tribute. He's still with you Preeti, in the memories that you have. He gave you a magical childhood. I hope your readers' love towards your writing and way of expressing emotions helps you in easing your missing him. Your dad sounds like an awesome Dad! :) He is always with you Preeti, if not physically...in your soul...:) Take care! As someone who has never faced a loss like yours I can’t even begin to comprehend the empty ache you must be feeling. But your Dad does live on Preeti- In the way you live your life and the way you are bringing up Atul and Purvi. Such a beautifully written Tribute. A big warm hug from me. Such a strange coincidence...I started re-reading your book a few days ago... I think I mentioned this to you too... And for some reason I got stuck on the story about your Dad. I even read it aloud to Leo & Amanda and my friend Melissa & her daughter Madeline... All three times, I ended up with a lump in my throat and tears streaming down my face... I know what it is to lose someone close to your heart.. Even though my Mum was taken away from us in 1995, I miss her so much till this very minute... As you know my Dad, who is 81 yrs old is still alive and a big part of our lives... He has been our "rock" and is helping us handle everything we are going through right now...... Your tribute to your Dad brought back so many memories of my own. I must mention the strong resemblance Purvi has to you as a child ... As if she is in that picture living in the B&W era. A big hug for you. Some aches are worth lugging along in life I guess. this was one of the most touching things i have read in a long time. It makes me feel very sorry yet happy for you because you are truly lucky to have experienced what I feel is the most pious relationship for a girl. I'm sure his soul rests in peace, seeing his children do so well in life. And i'm so glad you exist! and i just read your reply to one of my previous comments: yes we do sound very alike! My friends keep telling me that! I'm based in delhi and you absolutely HAVE to let me know whenever you take a trip down here! P.s. This post brought tears to my eyes. It's amazing how much difference someone you've never met can bring to your life. That was the most beautiful thing any father would love to hear from their children...touching. he must have been wonderful. Nice post on Bhavu. I to this day remember him, so clearly like it was yesterday. He was a lot of fun for sure. Memories are always going to live thru us. I am not sure if you remember that Bhavu taught me how to ride a bike. Do you remember that, we used to go to your school grounds and there were so many Gulmohar trees on the road side. Will never forget that. We had come to Manglore during summer vacation and you guys were staying on the top floor of Shenoy mam's house. It was so much fun. We were going somewhere thru chic Manglore and the way he drove was so much fun for us kids......We will all remember him and he will live on thru us. It brought tears to my eyes. I feel that they never go away but are with us in our thoughts, memories and in our heart. i am deeply touched .. it brought tears to my eyes. Time does not heal everything. Your have painted a very nice picture of your dad. May you have the strength to deal with the loss when you feel it badly. 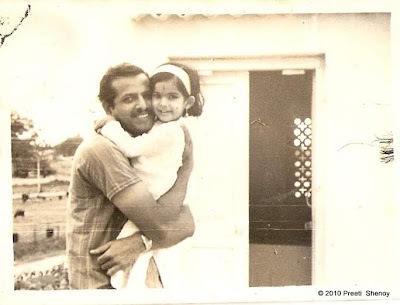 I am sure he is very proud of your achivements Preeti....priceless photograph! Oh this makes me welly. Sorry Preeti, about your amazing father. True... you have got lovely memories which is a treasure indeed!! A wonderful tribute to your dad. I am sure he is watching you with pride and maybe even showing you off. May you be blessed to find a treasure of positive memories of your dad. Reading your blog after a really long time....Beautiful and moving tribute to your father...May his Soul rest in Peace.....It is extremely difficult to put in words regret for the loss of your father..
My eyes turned moist when i was reading this. Your dad must be proudly reading this from above. Not sure if there is anything I can say to make you feel any better. I love the picture - your dad is so handsome and you look so beautiful, so loved in his arms. Memories are for ever and that what we live... and each day pass by will create some new coolest memories in future time. So enjoy each and every day..
p.s. 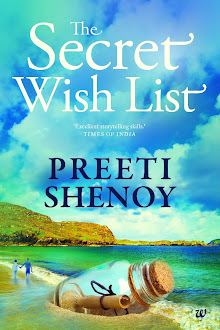 I happen to buy your first book and its just simple and amazing as each one can co relate one of other such incidence..
Preetiji, loss is always painful.And a loss like the loss of dear ones is unrepairable.The lovely bond u shared with your father is what every daughter would like to have.But all are not lucky.Some children have to bear the early loss of their parents.If we can bring smiles in the lives of some of these children it would be a great satisfaction. I wish (but what happens by mere wish) that all children get parents like you and like your parents.By the way YOU ARE LOOKING NICE AND SWEET IN THE PICTURE AND YOUR REVERENED FATHER IS OOZING OUT OF LOVE! A very moving and touching post.. Extremely sorry for the loss.. Relationships are priceless.. No matter how hard it definitely aches.. Your dad still lives in all your writings and in everything you do that you learnt from him. He seems to have been a great person. Love the picture. The post brought tears in my eyes. Memories keep them alive. This is a wonderful tribute. Jyothi: I agree.Thank you so much. Shalini: Thank you so very much. Yes he does live on inside me. Sushobhan:Thanks so much. Yes it does ache. Roshan: thank you so much for a wonderful, sensitive and a kind comment. Anish: Thank you for buying my book and happy you liked it. Thank you for your kind words too. Thinker: Lots of love back to you my friend. Thank you. Pink Dogwood: thanks so much. Yes the picture is indeed one of my favourites too. Asha: I wish he would/could. Who knows what happens after we die. Thanks. Rujuta:Thank you so very much. Softypink: Thank you so much. Indeed the memories are treasured. Vinoo: Yes--priceless pic indeed. Thanks. Palsworld: It isnt a painted picture. It is the truth. Thanks. Raam Pyari: Thanks so much..You will be surprised how much a few words actually comfort. Sandya; yes of course! Glorious memories :) He was one swell guy, my dad. Sruoloc: I guess we all have to face this loss sometime. Treasure the time you have and guard it jealously. Take lots of pictures. Sucheta: We MUST meet. I was in Delhi last month but it was hectic and had to meet many people. Lets exchange numbers. Also adding you on FB. Will call you from here :) and yeah we will surely meet. Meg: You absolutely said it my friend. Some aches are definitely worth lugging on for. Prettywoman: thanks a lot. :) He was my everything. Writerzblock: I have :) Thank you. Rohan: It indeed does. Thanks so much for the kind words. pointblank: Sometimes tears have to flow. Thank you and happy you have a wonderful bond with your dad too. Deepti: I am so glad you did. Nairlakshmi: Not sure if you are the same person as Laksh and lakshmi..but yes I agree with what you say. Krishna: Thanks a lot for your very kind words. Fresh on pixel:Sorry for your loss too. But remember what does not kill you only makes you stronger. "Most days I am fine, but some days,the aching just does not stop." :) Lovely article...Maybe you've inspired me enough to write about my dad! This is the first reason I connected with your blog immediately. Your love for your Dad somehow reaches out and touches my heart(I lost my Dad too 10 years ago...I miss him even today). My condolences - he lives on through your words. Hugs to u preeti ! Physically he might not be there..bt memories make him very much alive!! !--Take care! Oh, how much I wish for a daughter too... So that I can teach her everything and have a lot of fun. You have a special bond with ur Dad. It comes through your Blog. the other day you had said, that your success is due to him. It is a lovely tribute to him, and a gr8 way to keep him close to your heart. Very touched by the post, I too had lost my mother, the most prized possession i had ever, in 2005.It is paining me a lot even my most busiest hours as it was in 5 yrs ago. I am feeling as if I am still there in 2005 right that moment. Once you had said,`Behind every smiling face, there is always some pain hidden`......I know how it feels, I have lost my mother as well!!! Anyways, gotta live, and if live then why not to the fullest? Right?